Welcome to Journey of Faith - Torrance campus! We meet every Sunday morning at 9:30am & 11am at Torrance High School. We’re excited to help you learn more about God, grow in your faith, and be empowered to make a difference with your life. Every Sunday, we want your family to hear a message that will speak to your life and experience music that will inspire you. Whether it's your first time in a church or the first time back in a long time, you're welcome here. As you get close to the Torrance High School campus, look for signs and our friendly volunteers who will help you get parked and find your way around. If you are visiting us for the first time, make sure to stop by our Guest Services desk by the Auditorium entrance. We'd love to answer any questions you have and give you a special first-time visitor gift! We're so excited for you to check out Journey of Faith – Torrance campus! Our motto is "Come as You Are," so we work hard to create a comfortable, exciting place for you and your family to explore what it means to have a relationship with God and grow in your faith. The 9:30am service has programs designed for adults, kids, and students through grade 12. The 11am service has programs designed for adults and kids. Because the Torrance High School campus is so spread out, it's a great idea to arrive about 15 minutes early. 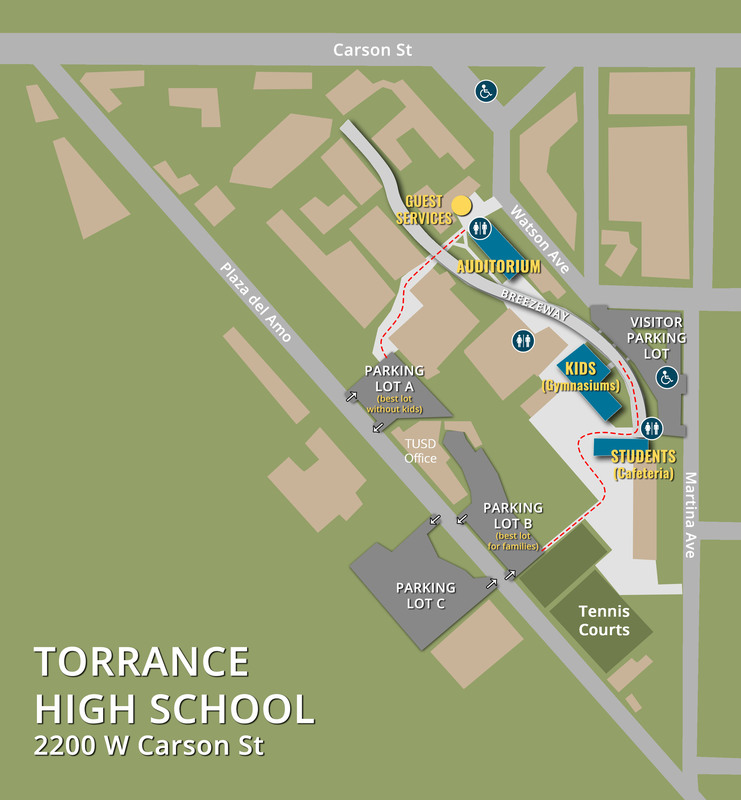 As you get close to the Torrance High School campus, look for signs and our friendly volunteers who will help you get parked and find your way around. You can check-in your children (nursery– grade 5) in the Small Gyms, let your students (grades 6–12) connect with great leaders in the Cafeteria, grab a cup of hot coffee for yourself, and head to the main worship service in the Auditorium. If you are visiting us for the first time, make sure to stop by our Next Steps area by the Auditorium entrance. We'd love to answer any questions you have and give you a special first-time visitor gift! Our service lasts about an hour. We begin with a time of singing and worshiping God, hear a message based on the Bible, and then wrap things up by praying together. You’re invited to come as you are—no need to dress up! Our kids and student environments are designed specifically for those age groups. Your kids will have a blast as they take part in fun activities, connect with their peers and amazing adult volunteers, and learn more about God in language they can understand. These programs will become their favorite part of the week! Kids ages 8 weeks – grade 5 meet in the Small Gyms. We don't just want you to observe what happens here at Journey—we want you to be a part of it! One of the best ways to get engaged and meet more great people is to volunteer in a serving role at Journey. Our volunteers serve either the 1st and 3rd weeks (Team A) or the 2nd and 4th weeks (Team B) and it takes over 70 volunteers on each of those teams to run Sunday morning services! Whether it's helping to set up and tear down, being part of our kids or student programs, or helping other people feel welcome by being part of the Hospitality team, there's a place for you! The first step to serving is to fill out the short form below. Once we receive your submission, the department leader for your volunteer area will contact you for more info, to help you find the perfect spot. We believe that life should be done together! Our Life Groups are groups of 10-15 people that meet in homes around the Torrance area. Groups usually meet weekly or every other week and always include time for getting to know each other, prayer, reading the Bible, and fun! Click the Life Groups tab above to learn more and sign up for a group. We don't just want you to observe what happens here at Journey— we want you to be a part of it! One of the best ways to get engaged and meet more great people is to volunteer in a serving role at Journey. It takes over 70 volunteers a week just to run Sunday morning services! Whether it's helping to setup and teardown, being part of our kids or student programs, or helping other people feel welcome by being part of the Hospitality team, there's a place for you! Click on the "Serve" tab above to fill out our serving interest form. We couldn't do what we do without the financial support of our amazingly generous attenders. We believe that giving is an act of worship and celebration! We all have situations or seasons in which we need even more care and support. At Journey, we want you to know that you're not alone. We have many resources available to help. NOTE: Most of our care programs are hosted at our Manhattan Beach campus (1243 Artesia Blvd, Manhattan Beach, CA, 90266). Clicking below for more information on our care ministries. Most Life Groups are co-ed and include members of all ages. Childcare is often coordinated between the participating families, so don't worry about having to find an additional sitter. Click here to start the process of finding a group!